Alan tries to resist his impulses. A year after a high-speed collision with an eighteen-wheeler on his wedding day, all is not well with former Grand Prix driver Alan Colby (Ronald Williams). Even as he and his wife Denise (Diane Cilento) head to southern France for a vacation, Alan struggles to overcome sporadic compulsions to...strangle his wife. At their hotel, the Colbys meet David Prade (Claude Dauphin), an inquisitive psychiatrist who lives in a nearby villa. During a dinner with Prade and others, Alan has a violent outburst, punches the doctor, and leaves. Later that evening, Denise express her deep concerns about Alan to the psychiatrist, who astutely observes: "Your husband is in a state of acute anxiety." Stop Me Before I Kill!, also known as The Full Treatment, is one of those films in which it's obvious from the start that all is not what it seems. But director and co-writer Val Guest does an admirable job of keeping the viewer guessing. Is Dr. Prade to be trusted...especially after spying on Denise as she skinny-dips (her reflection in his binoculars is one of the creepiest shots in the film)? Is Denise really the loving wife? What's up with that mention of her brother, who died in a auto race at Le Mans? As for Alan, there's no doubt that the lad needs serious therapy for his murderous tendencies. One of several Hammer suspense films produced in the 1950-60s, Stop Me Before I Kill! lacks the cleverness of The Snorkel and Scream of Fear. Still, Guest, an underrated director, squeezes the last ounce of tension out of his plot. He also creates a visual uneasiness by filming through vertical bars (implying that Alan is trapped in his mental state?) and using extreme close-ups of wringing hands, quivering lips, and troubled eyes. The only flaw in his direction is a too-long sequence where Alan undergoes the kind of psychiatric therapy that causes doctors to lose their licenses. Despite some plot issues (e.g., Alan was never in therapy before?) and its length, Stop Me Before I Kill! remains an entertaining suspense picture. It boasts good performances and enough red herrings to keep you fishing for more all the way to the climax involving a chair lift (which you knew was going to be important as soon as you saw it earlier in the film). En route to Provincetown, an airplane pilot experiences engine trouble and lands on a supposedly deserted island with his passengers, an alcoholic actress and her assistant. The island is, of course, anything but deserted. 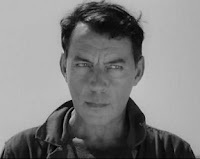 The only human inhabitant is the creepy Professor Peter Bartell (Martin Kosleck). Note I said human, because the other inhabitants are the shiny flesh-eating microbes that Bartell has released into the ocean. A legitimate cult classic, The Flesh Eaters is a virtual textbook in how to make an effective low-budget horror film. Director Jack Curtis pulls out all the stops in creating a sense of unease: a whistling wind sweeping across the beach, a swinging light bulb casting weird shadows, a man in a scuba suit unexpectedly emerging from the ocean, and a skeleton washing up on the beach. Curtis's best work may be the opening scene in which two teens on a boat disappear down into the ocean as an expanding circle of blood forms in the water (an effect repeated in later movies). Indeed, the tiny monsters turn the ocean into a surrounding wall of water that traps the protagonists on the island. It's a clever premise--and helps the budget, too, because it minimizes the number of times the flesh eaters need to be shown. (Unfortunately, an unimpressive large version of the flesh eaters made an appearance at the climax). The cast standouts are Kosleck as the baddie and Rita Morely as the hungover actress ("I drink...not polite cocktails...I drink!"). Byron Sanders plays the dull, hunky hero, Barbara Wilkin is the pretty assistant, and Ray Tudor pops up as a beatnik who meets a gory demise. The Flesh Eaters is certainly not a brilliant film, but there's no denying the talent behind the camera. Sadly, director Curtis never helmed another movie. He did, however, provide the voice for Pops Racer on the cartoon series Speed Racer (1967-68). Rick, I enjoyed your double-feature post of STOP ME BEFORE I KILL! and THE FLESH EATERS almost as much as I enjoyed hearing that director Jack Curtis was the voice of Pops on SPEED RACER! :-) I always appreciate movies that can keep audiences eager to see what happens next and conquering a low budget while they do it. Excellent post! Dorian, they both maximized their budgets very well. I'm not sure if it's true, but I've read that the spouse of one of FLESH EATERS backers won money on a quiz show and invested some of their winnings in the movie. CS, cable's Independent Film Channel just showed THE FLESH EATERS, so maybe it will be on again soon! I noticed a scientific link between your two posts: "Stop Me" features questionable psychiatry and "Flesh Eaters" has a disturbing professor. Both films also feature unpleasant water scenes. "Stop Me" is a cut above, principally because of Val Guest's direction and story. But they would indeed make a good double feature, with or without a drive-in. Good warm weather post, Rick! A clever observation, Toto! I wouldn't want to have an appointment with either of these doctors! Rick, I have seen Stop Me Before I Kill! years ago. It is a little slow but it builds up to an interesting ending. I have a close friend who gave me set of Hammer films. I watched it alone in my den with the lights off. The plot is clever and keeps you on your toes trying to figure out what is going on. 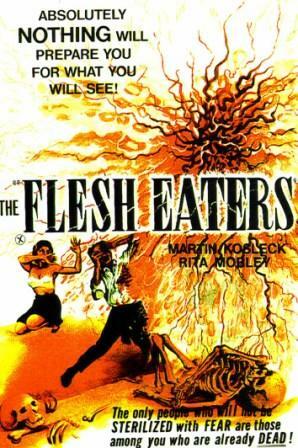 I have probably seen The Flesh Eaters but have forgotten that I saw it. It sounds like a movie I'd like alot. Enjoyed your article. I saw this movie with my wife when we first met. She loved old suspense movies. One night we watched it on TV. Stop Me Before I Kill was okay from what I remember, but I was more interested in the woman I later married to pay close attention to the script. My wife said she liked it though.